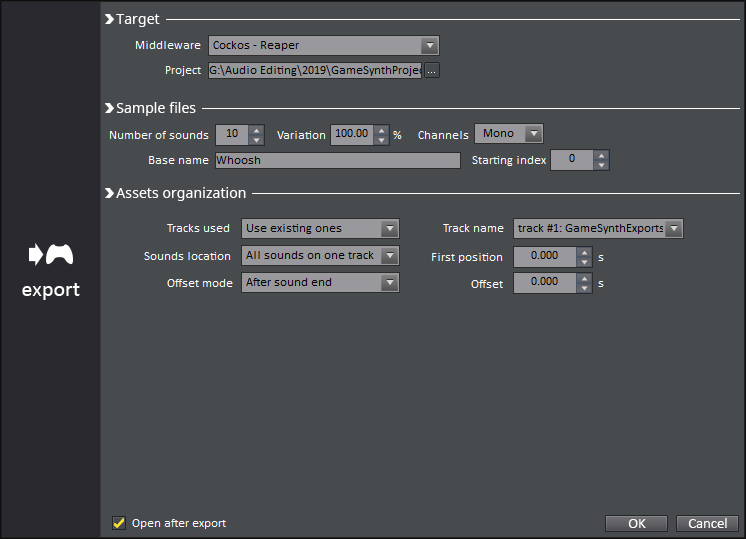 GameSynth supports rendering to a host of different Audio Middleware solutions, and now even supports exporting to Cockos Reaper. Reaper is a flexible and powerful DAW, especially for sound design, editing, and generally managing more complex projects. In this blog, we are going to showcase this export feature and offer some tips for taking full advantage of it. The first thing we need to do is head to GameSynth’s settings and tell it Reaper’s executable directory is so that we can instruct Reaper to launch from the export menu. Once you have created a patch, you can then export many different versions of this sound. Open up the export menu and select Cockos – Reaper as your Middleware. From here, you can specify the target project for exporting. The options in this section are relatively self-explanatory. The Variation box specifies a percentage of the currently defined random ranges. So, for example, if you set pitch to have 50% random deviation from the value in the GameSynth tool, then setting this global Variation parameter to 50% would result in the pitch having a variation of 25% instead. Here you can also define the name and append an index to each item exported into Reaper. Set your index higher when rendering out more sounds with the same name as previous renders to avoid overwriting. This section defines the export logic. You can create new tracks if you just want to dump all the new files in, or you can export to a pre-existing track within the Reaper project, by specifying the track from the dropdown next to Track name. Using the First position option in conjunction with the Offset mode and Offset value options, allows for exporting to a specific time within the project. These settings facilitate the use of GameSynth as a sound design tool for adding layers to sounds which are already set up within the project. For any sound that loops indefinitely, a new window will appear after pushing OK, prompting you to set how long you would like your final export’s duration to be. Once in Reaper, you can make use of some of its handy features to optimise your workflow. For example, if you’re using GameSynth to creating a series of randomised sword slashes, you can harness Reaper’s takes system to audition between different versions. Or if you’re crafting a layered impact, GameSynth can help you to export your additional layers to the right part of your Reaper project. Let’s look at some of these synergies. Since GameSynth allows for applying randomisation, you might not always like every variation. If you are outputting a few different sounds to pick the best ones, you can use Reaper’s Takes feature to clean your project up. Right-click-drag to select a few items, then right-click any selected item, and select Take → Implode items on same track into takes. You can then cycle through by clicking on the different takes, or use T for cycling forward and Shift+T to cycle backwards. The Take menu also has other helpful features such as locking the current take, so that it’s not accidentally changed once a good take is selected. If you design variations on a consistent timescale, you quickly sync up sound effects from GameSynth. You can use your edit cursor inside Reaper to find the First position time, and move it to the next item to determine the Offset (or you can view the time on the timeline). 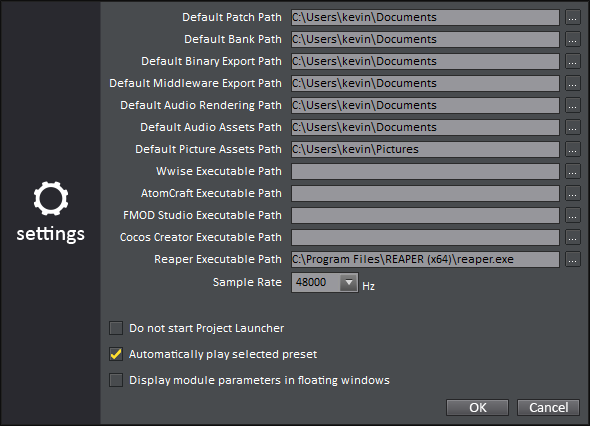 If you’re using Reaper, then the SWS extension pack is a must-have addition (and it’s free!). One of the great Actions that this pack provides is the ability to create seamless loops easily. This feature is handy for creating loops that still play infinitely, but without using GameSynth’s run-time component. Set a time selection by left-click-dragging across the timeline above the item you wish to loop, select the item, and run the X-Raym_Create seamless loops from selected items sections inside time selection Action. You can then audition this by pushing R, which will Toggle Repeat playback within the timeline selection, and pressing play. Article written by Kevin Doran.